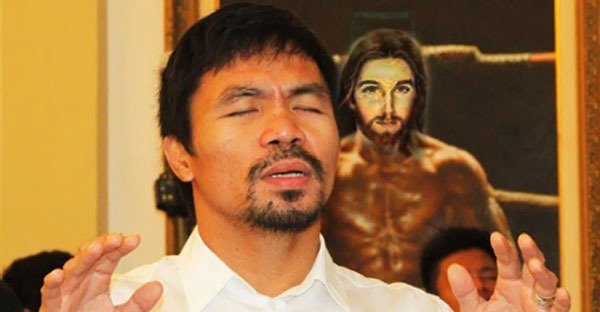 Manny Pacquiao’s prayer training is well known to Christians worldwide, the champion fighter spending over an hour a day sparring with Satan by the power of his Christ-fueled prayers. When you’re having battles with Satan on the astral plane, fighting against a basic human like Floyd Mayweather is a walk in the park. It is no surprise that God has spoken not only to Manny Pacquioao but many other Christians to let everyone know the spread on this fight should be 5 to 6, in favor of Pacquiao. In addition to proving that all athletes should follow a Tim Tebow, Manny Pacquiao route and declare they fight for God and country, it will also prove that there is no greater training in life than the power of prayer training. When you are strong in faith, all mountains before you shall be moved.